Earlier today I logged into LinkedIn to see what my professional network was up to. There were the usual status updates and developments, but then something caught my eye. A random LinkedIn user named Barry Wills had posted a comment asking everyone who sees his update just to comment by saying 'seen'. By the time someone from my network had posted that comment, there were 16,512 others who had already done it, with 3,052 'liking' it too. Around an hour later I logged in again to curiously see how many more comments or likings the post had received. The snowball effect seems to be only starting as there were around 500 more comments on the update. 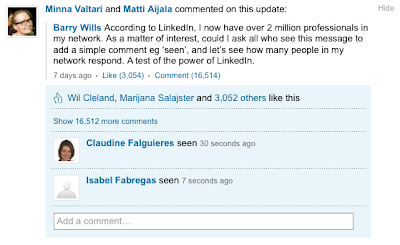 It remains to be seen whether the post will reach all the 2 million professionals in Barry's network. 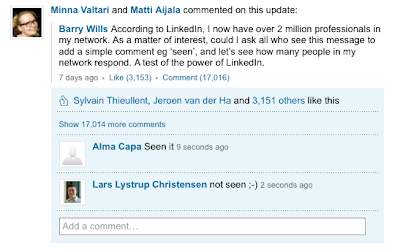 Even if it doesn't, it already showed the power of online social networks such as LinkedIn. PESHAWAR, Pakistan, 17 August 2010 – UNICEF Regional Director for South Asia Daniel Toole visited Pakistan’s Khyber-Pakhtunkhwa province this week to survey the devastation caused by the country’s severe flooding. Forget about the obsession on the economic growth of the likes of China or India. We all know the facts and the figures. One of the arguably most untapped potentials, as participants of last month's Inaugural Oxford Islamic Branding and Marketing Forum were told, lies in fact in the growing Muslim lifestyle, halal food and Islamic financial markets. But are the big bucks all we should be after? Here's some 'halal' food for thought from a fascinating two-day Forum. Having been involved in organisations educating for cross-cultural understanding and possessing a degree in the field too, I've moved beyond the pure focus on 'culture' to developing a preoccupation for thinking about creating some cross-religious understanding too. Living in the age of the image, it is the mental associations people have of other people of faith that indeed seem to shape the way lot of the current affairs are going. So wearing my social entrepreneur hat, I decided to take part in the Inaugural Forum organized by Oxford University's Saïd Business School. Brainchild of Dr. Paul Temporal, the Inaugural Forum boasted an impressive list of influential speakers from East to West, Muslims and non-Muslims alike, who gave their accounts on the Muslim markets. Yes, it's a pluralistic concept, as the Muslim demographic is certainly not a monolithic entity but "more of a mosaic" as Basil A. J. Mustafa, a Nelson Mandela Fellow and Bursar at Oxford Centre for Islamic Studies, put it. Mishal Husain, a famous International Broadcast Presenter working for BBC, was leading the panel discussion on the perceptions and perspectives of the Muslim world today. Sarah Joseph, the editor of the Muslim lifestyle magazine and media company Emel and an influential figure herself, was there too taking part in the panel discussion regarding the opportunities and challenges in reaching the Muslim markets. Attending the Forum were several other fascinating public personas, including the likes of Shelina Janmohamed, the author of 'Love in a Headscarf' and a writer for the Guardian. In the run up to the Forum, Marketing Week ran a particularly interesting story on the fast growing size of the Muslim markets which especially most Western brands have so far failed to recognize. Titled Young, connected and Muslim, the article goes on to describe the estimated 2USD trillion (and growing) market of just one the new Muslim consumer segments referred to as 'the Futurists' by the branding agency Ogilvy & Mather. As it was, Ogilvy & Mather Worldwide CEO Miles Young was there to kick off the Forum presenting the agency's new market research report (priced at 9,450USD) entitled 'Brands, Islam and the New Muslim Consumer: how to build brands that appeal to the Muslim consumer'. So convinced were Miles Young and co. of the growth of the Muslim markets, that they have even launched Ogilvy Noor, branding itself as the "worlds first bespoke Islamic Branding practice". Wearing my Digital Researcher hat, I was particularly keen on hearing from the Egyptian entrepreneur Mohamed El-Fatatry, CEO of the highly successful Muxlim, a social media business founded in the Finnish capital of Helsinki. The social networking site and its founder have recently received presidential attention from the likes of the Finnish president Tarja Halonen, who awarded El-Fatatry the Finnish 2009 Internationalization Award, and Barack Obama, who earlier this spring invited El-Fatatry to his Presidential Summit on Entrepreneurship where Hillary Clinton gave an interesting talk (have a look at the video on the site). If you are interested in digging deeper into Muxlim's success, have a read of an article by the Guardian or watch the below interview of El-Fatatry by TechCrunch. How about 'Islamic social entrepreneurship'? While there are many angles in which to analyse the two-day Forum, I shall choose to view it through my social entrepreneur goggles. So here goes. Miles Young and many of the other speakers were constantly dubbing the Nestlé corporation as "the role model for Islamic branding" over the course of the two-day Forum. But is Nestlé truly the role model one should be aspiring to in this context? Sure, the corporation has made $5,2 billion in revenue from halal branded goods, as we were often told, but with a long standing global Nestlé boycott campaign ongoing since the 70s, many other corporate scandals to its record as well as a recent Greenpeace campaign (also resulting in a Facebook PR disaster) only boosting the Nestlé boycott, can the infamous-among-many corporation be really be praised as 'the role model'? Business is a means to an end. But what is that end? Is the business, which may be attempting to brand goods or services as 'ethical' and 'sustainable', primarily driven by the objective of maximizing shareholder value while simultaneously posing a perceived sincerity in the public realm and trying to manage its reputation by a carefully executed million dollar brand management strategy? Back in 2000 BP poured millions into launching its new green 'helios' brand based on newly defined core values. But with the reality of the company behind the brand being something altogether different, how seriously can we take the brand promises of the modern corporation? With the Enrons, the Maddofs and the latest financial crisis looming at the back of most people's minds, the public trust in big business is at an all time low. And rightly so. What I personally felt was missing throughout the whole Forum was a deeper debate around an existential question: what do we see being the purpose of business? More precisely, what should it be in the context of Islamic Branding and Marketing? And what does it mean to be 'halal' anyway? "I would urge all those engaging in creating ‘Islamic’ brands to move past just tweaking products so that they are technically Islamic, and start thinking about the Islamic values that are crucial to new products and then design products from the ground up." Ultimately what lies at the heart of the 'Islamic Branding and Marketing' challenge of the 21st Century is not whether or not Western brands have failed to make money out of 'the Futurists' or 'the Traditionalists', two of the many Muslim market segments identified by Ogilvy. As far as Muslims and many aware non-Muslims are concerned, brand Islam arguably suffers from an undesirable brand positioning both internally and externally. Externally the trend to dehumanize the world's 1,5 billion Muslims should be countered by better Islamic Branding and Marketing while simultaneously the development of an internally shared understanding of common values should be fostered. Diligent and competent people should indeed be actively working to transform some of the prevalent mental associations so that the world could come to recognize the shared humanity that binds us all. Add to that the growing economical inequalities of the world affecting especially a lot of the Muslim majority countries and the message becomes clear: we should forget about the numbers that make the economists blink with dollar symbols in their eyes for there are far greater challenges at hand. In my view the answer lies in the notion of social entrepreneurship, which was a term I don't recall hearing during the two day Forum. Social entrepreneurship, I feel, is truly the way forward in creating a new basis on which socially and environmentally conscious brands could be built. When already some of the leading social entrepreneurs are indeed Muslims, consider for example Muhammad Yunus, the 2006 Nobel Peace Prize winner for coming up with microcredit and microfinance, the omission of the concept was all the more striking. "Muslim consumers want to see the entire company or the organisation is ethical, and genuinely do business to favour the public as a whole, regardless of race and religion, while generating reasonable profit for self business. Muslims disagree with greed, which is one of the greatest sins; I’m sure this is the case with all other religions too." Next time if the Saïd Business School decides to run Forum 2.0. how about co-opting the Skoll Center for Social Entrepreneurship as one of the organizers? 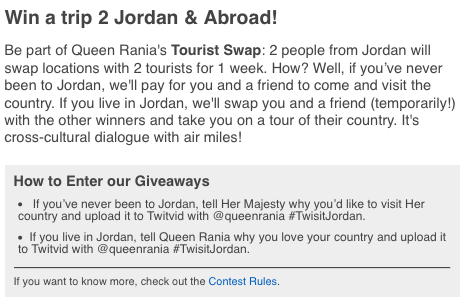 Rania Al Abdullah, the Queen of Jordan, who seems to be an avid user of social media all round, launched a clever social media campaign called Twisit Jordan a couple weeks ago where User Generated Video played a key role. The campaign was promoted across all her social media profiles including Twitter, Facebook and YouTube. The concept was simple. Videos were invited from her international audience highlighting why they'd like to visit Jordan. On the other hand her fellow Jordanians were prompted to post a video showing what they loved most about their country. 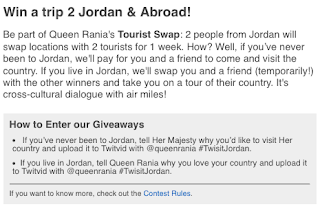 Competitors were instructed to post a video on Twitter's video application, the YouTube style TwitVid marked with @queenrania and hashtag #TwisitJordan. As often tends to be the case where User Generated Video is used effectively, this too was a competition held in a limited time frame. The best international entry would win a trip to Jordan while the best Jordanian entry would win a trip to the country where the awarded 'why I want to visit Jordan' video came from. 'Cross-cultural dialogue with air miles' went the slogan. Very clever country branding indeed. Why this stuff is effective? Just look at the figures. The top 10 videos have over 56,000 views as we speak while Queen Rania's promotional campaign video has amassed over 121,000 views so far. When you add to that all other exposure to the campaign on various channels and the ongoing conversations around it (see e.g. the tweets with the clever hashtag #TwisitJordan), the buzz generated has been undoubtedly worth the effort. With a cool 1,317,168 followers on Twitter, 300,540 fans on her Facebook page and 28,312 subscribers to her YouTube channel, Queen Rania is certainly in a position where she can leverage her social media following in many creative ways. Here's what I'm hoping will be the winning entry from a couple who were pitching to 'Twisit' Jordan. Congratulations to Stephanie and Pete (who are, by the way, members of CISV International, an NGO I was involved with rebranding) for the great effort. I certainly wouldn't mind to be hosted by the high-tech Queen!